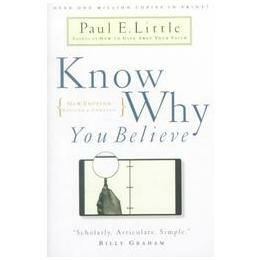 I’ve had Know Why You Believe by Paul E. Little on my shelf for years, on only recently picked it up to read it. The edition I read was published by InterVarsity Press in 2000, and was revised and updated by Little’s wife, Mary. I devour just about every book about apologetics I can get my hands on, and this book is by far the best “layman’s” introduction to Christian apologetics that I have ever read. By no means is an exhaustive reference, but true to InterVarsity form, it’s short, to the point, and very clear. I highly recommend every youth worker to have a copy of Know Why You Believe on his or her bookshelf. It’s got solid answers to the most common questions I’ve fielded from teenagers over the years, such as “Is Christ God?” “Is the Bible God’s Word?” “Do Science and Scripture Agree?” and “Why Does God Allow Suffering and Evil?” I also think it would make a great book for a small group of students if they were interested in knowing more about logically defending the truth of the Christian worldview. And for youth workers who feel at a loss in their own lives for how to engage in apologetic conversations (and teach their students to do the same), it’s a great resource. There are plenty of used copies available for cheap online!